Greetings to all from Jerusalem and an early Chag Sameach and Kosher Pesach to all! Please read below’s context before watching the short video above on LGBTI Activism in Kenya. Today I want to bring up a controversial issue that I am quite passionate about and seems to now transcend continents. As a short back story, (and I wrote briefly about my affiliation to this issue in a post back in December on World Aids Day….https://cafeavra.org/2010/12/02/world-aids-day-2010-tribute-with-kenneth-cole-liza-minnelli-tyson-beckford/ ), throughout my time in Nairobi I got very close to the LGBTI community and met some amazing, kind, and talented friends that I now miss very much. Due to the criminalization of homosexuality in Kenya, they are mostly a hidden community of activists, by default, who face a multitude of challenges each day…but still have time to smile. And why has this suddenly re-sparked my interest? For a second it threw me aback…wow, okay, yes….ofcourse there are religious LGBTI individuals….I met them in Kenya and Uganda…they were my friends there! But maybe because they were religious Christians it didn’t touch home so hard. And I live in Jerusalem now. It is a religious city, and you forget for a second(well actually almost completely) that some of these men, or women, you see on the streets actually define themselves inside as LGBTI. I took him to a small LGBTI party on his last night in Kenya at a friend’s apartment, so he knew the scene a little bit. So once I saw the religious guys I immediately said to him that I was a bit surprised for a second to see any religious guys here! He said, I know me too in the beginning but of course they are part of the community. And he said, Jerusalem, for the gay community, is like Kenya all over again in a certain way. Which in a way is true, especially for those who grow up religious. Though, as a back up, you have Tel Aviv! 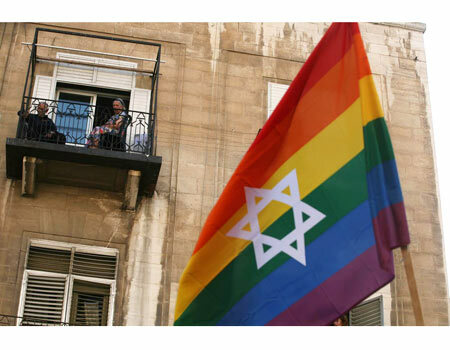 And at least you have one designated gay evening per week here in Jerusalem…in Kenya, it could not be possible. But, when it comes to LGBTI issues, I really do believe that you can be religious, love GD, and GD also loves you…even if you classify yourself as LGBTI. If you are Jewish, that is, someone born of a Jewish Mother, and you identify as being Gay or Lesbian…you are just as beautiful in GD’s eyes as those who identify as Straight. A good person is a good person. A person who is kind and does mitzvahs for others is extremely beautiful in gd’s eyes. And because I am not Gd, who am I to judge or treat a LGBTI friend, or person, any different from anyone else. And the fact of the matter is, most of the people I know who identify as LGBTI happen to be some of the most amazing people I know. Some consider themselves religious, and some do not. I made the video above for a few reasons. First, to connect you to a member of the LGBTI in community in Kenya who, with a huge smile as you will see, works in creating dialogue with religious Leaders in Africa. And to reiterate that South Africa is the only country in Africa where you can be openly LGBTI. Hardly anyone I met in Kenya has been to a Gay Pride Parade, as the only one on the continent is in South Africa and it is usually quite an expensive journey. My friends in Kenya dream to be able to attend a Gay Pride Parade, and if I truly had the money, I would try to bring them all over to Tel Aviv and Jerusalem this upcoming June for the day’s here. (My next follow-up post, gd willing, will be pictures from both pride days). Thanks for reading, especially if you are someone who is not as open as I am to LGBTI issues. And to those LGBTI friends outside Africa…remember the video above and do not forget their struggles! Try to connect to the community in Kenya. Or please do email me at cafeavra@gmail.com and I will put you in touch with GALCK. Previous PostPrevious A Tribute to Mary Gardner. Next PostNext Erev Rosh Chodesh Iyar 5771. Old City. Jerusalem.